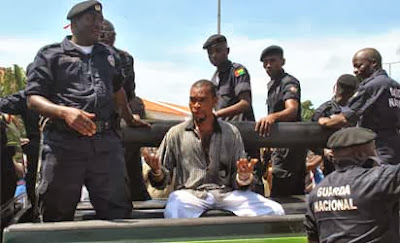 One of the three Nigerians accused of kidnapping a child is protected by security forces, shortly before being lynched by a mob which managed to grab him from a police car as officers stood by powerless. Three Nigerians accused of kidnapping a child were lynched to death on Tuesday by an angry mob of young rioters in Bissau, according to a hospital source. The trio was killed after the disappearance of a young boy on Tuesday morning in the capital of Guinea-Bissau. A rumour quickly spread across the city that the child had been taken by a group of Nigerians, prompting an angry crowd to gather which security forces were unable to control. The police called for reinforcements and soldiers from the Economic Community of West African States currently in the country were deployed in the town and managed to restore some sense of calm in the afternoon. Nigeria’s embassy in Bissau, where many Nigerians sought refuge, was surrounded by security forces for protection. Many shop-owners in the city closed because of the violence. The latest abduction came at a tense time in Bissau, as in the past fortnight several kidnappings have been reported to the police. Abductions are currently an explosive topic, among the general population and on radio shows in Guinea-Bissau, prompting a number of rumours about who has been responsible for the disappearances. The authorities have enforced a travel ban on unaccompanied children and any adults travelling with infants who they cannot prove are relations are immediately arrested.